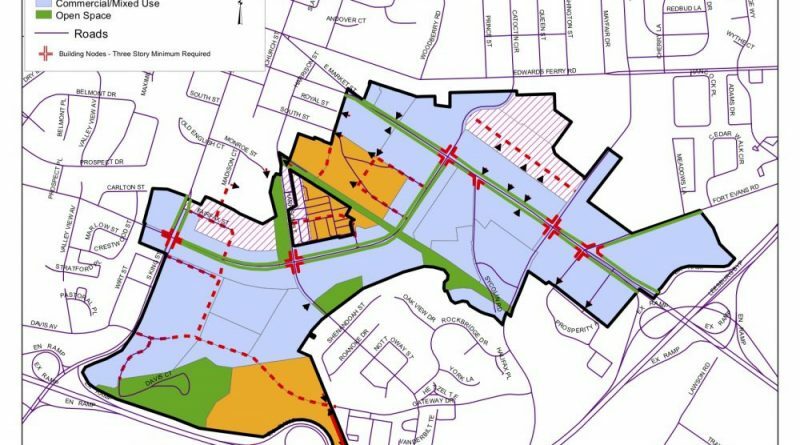 This map depicts the layout of future development expected in Leesburg’s Crescent Design District, but implementation of the program, first adopted in 2003, has been slow. 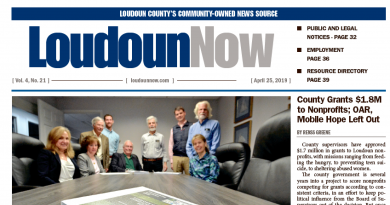 As part of a comprehensive look at changes to a major redevelopment area in Leesburg, town leaders will be considering some temporary changes they hope will spur investment in the area. Eleven proposed modifications to the zoning rules governing the Crescent Design District, a 428-acre area along East Market Street, Catoctin Circle and South King Street north and west of the bypass, were presented to the town’s Planning Commission last week. The modifications hope to spur some developer investment in the area that, since the adoption of the Crescent Design District Master Plan, has failed to happen. When the Crescent Design District was adopted as part of the town’s Zoning Ordinance in 2013, hopes were that the innovative use of form-based code zoning rules—which regulates building design and layout more than uses and promotes a pedestrian-friendly, walkable environment—would spur redevelopment in the area. Instead, the zoning rules have come under intense scrutiny from both the development community and the Town Council for being confusing, cumbersome and an obstacle to development in the district. Last summer, the Town Council endorsed a four-prong approach to correcting the problems in the district. One of those steps was before the commission last week with the staff-proposed modifications. Two others are ongoing—soliciting applicant input and a review and recommendations by the Form-Based Code Institute. The latter group is planning a return trip to the council, following an initial visit earlier this year, to deliver its final report April 8. Many of the proposed modifications deal with items like building setbacks, parking standards, building heights and uses. The modifications, if adopted by the council, would be implemented on a temporary basis until the council votes on comprehensive changes to the district, and would only be allowed for special exception or rezoning applications with council approval. The goal of the modifications is to mirror more urban-style standards, as many of the modifications deal with rules that are more compatible with suburban-style development. In several instances, town staff took a cue from the nearby B-1 downtown business district in an effort to meet one of the goals of the Crescent Design District—to create an environment similar to what is found in the historic downtown. If a modification is requested as part of a special exception or rezoning application, it would be judged against 11 approval criteria, including its consistency with the Town Plan, that it is not contrary to the purpose and goals of the district, that it won’t hinder the use of adjacent properties, and more. Brian Cullen, who purchased the Virginia Village shopping center from the Ours family in 2017, said he believes the 18-acre property would be a good test case for redevelopment in the area. The Planning Commission voted to continue discussion of the proposed modifications at its April 18 work session.